Karen is originally from Flores, Petén. 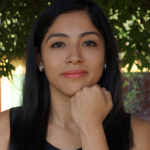 She was selected as a GOJoven Fellow when she was 23 years old. Karen is a young, dynamic and creative woman. Additionally, she is a Bachelor of Psychology student, with knowledge and experience in working with SRH and DSR subjects, and serving as a facilitator, trainer, educator and incident assistant. She started getting involved with the issues of Sexual and Reproductive Health at age 13 as a youth facilitator, promoter, coordinator, and currently supports the network of promoters and advocacy in the community.